27 SurpriseEveryone rushed to congratulate the wizard and shake his hand. "Take it easy", laughed Zettelwitz, pleasantly surprised. "Perhaps you wouldn't mind letting me go?" He asked the python politely. Slowly, the snake loosened its powerful coils. "I won't be far away", she hissed. 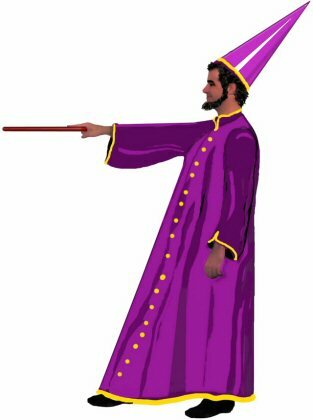 declared the wizard, flourishing his magic wand. He whispered something complicated. The sweet sound of a flute floated in the air. All the creatures he transformed came running, hopping and flying to join them. Ronya stormed towards the wizard in a rage. Zettelwitz held his hands up. "Miss Ronya, please don't be angry! I promise not to cause you any more trouble in the future. Can you forgive me?" "I'll conjure up a new birdhouse", he added in a hurry. "Any requests? I can make it any way you like!" The girl quickly calmed down. "No need", she said happily. "Surprise me! If the house isn't right, you can always change it!" There was a sound of soft music again and a new building appeared. It was so grand that everyone was delighted. Everybody clapped. "Magnificent! Beautiful! Lovely", they called. "You've done a magical job, Zettelwitz dear", said Ronya with shining eyes and gave him a little kiss. Zettelwitz was very happy. Ronja liked him! "That's not all I can do. I will now conjure up the whole alphabet for you!" The sun had gone down, and it was getting chilly. Everyone poured into the house. Inside, there was a surprise waiting for them. Tables groaning under a sumptuous buffet! What delicious food!